Brad Mckay was sent off in the Irn-Bru Cup semi-final against Crusaders. Caley Thistle defender Brad Mckay says the reality he must watch next month’s IRN-BRU Cup final from the stand is already hard to take. 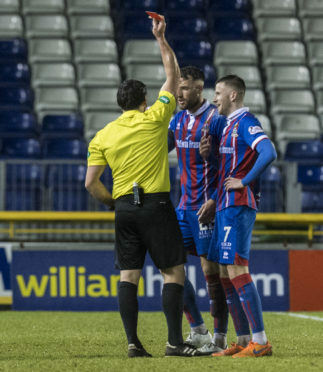 Mckay was sent off by Welsh referee Bryn Markham-Jones in Inverness’ semi final victory over Crusaders, meaning he will be suspended for the final against Dumbarton at McDiarmid Park on March 24. The former Hearts defender was shown two bookings meaning he is unable to appeal the verdict, which is the cause of much frustration. The 24-year-old will take on Dumbarton in tonight’s Championship fixture but he says his absence from the showpiece match in Perth will be painful. He said: “I thought the first one was so soft. For the second one, I didn’t think he was even going to book me. He seemed to take so long to do it and I asked him why. I think their players got in his ear a little bit and he’s either changed his mind or heard something from the fourth official. “It’s disappointing – I could have head-butted somebody or lashed out and got a straight red and missed the next league game but played the cup final. But it’s two yellow cards which I’m unable to appeal, which is even more frustrating. “When I was at Hearts we played Inverness in the League Cup semi final and they went down to nine men. Josh Meekings and Gary Warren both got sent off but Meekings’ one was a straight red which he appealed and got to play in the final. It’s not my place to say but I think there should be some sort of adjustment, if the referee has made an error. With Inverness’ hopes of making the promotion play-offs slim following Saturday’s 2-0 loss against Morton, Mckay is excited by the prospect of landing silverware by virtue of the cup, adding: “It doesn’t matter what cup it is – some people go their whole careers and never get to a semi final never mind a final. “Obviously you’ve not got the big teams in this competition but it was like a European tie playing against Crusaders. It was quite enjoyable actually, playing against a team we’ve not faced before.